It is day nineteen of the 40 Bags in 40 Days decluttering challenge. Have you had a busy weekend completing larger projects? I love to see your pictures of your bags going to donation! It is day eighteen of the 40 Bags in 40 Days decluttering challenge. How much have you been accomplishing this weekend? I just got back from traveling for the last week. One of the things that always strikes me as I review how much I over pack is how little we really need on a weekly basis. It is good to get away and get some perspective on how much you have. It is day sixteen of the 40 Bags in 40 Days decluttering challenge. If you have some time send me a message to tell me what has been the easiest and hardest part of the challenge so far. You can email me at kristin@livablesolutions.com. Let’s talk about pantry organization today. I know that some of you have been working on this in your own homes. Here are some of my favorite pantry storage containers for organizing a pantry. It is day fifteen of the 40 Bags in 40 Days decluttering challenge. I am so amazed at all of the great progress so many of you are making in small and large areas. It is day thirteen of the 40 Bags in 40 Days decluttering challenge. Thank you to everyone who keeps checking in with me about their progress. It is so fun to see all of your photos. Some of you have taken on some large spaces! Keep up the correspondence and we will keep positing the photos. 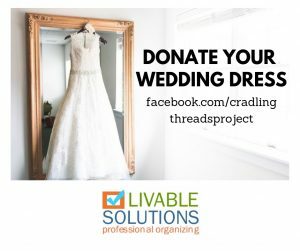 Send me an email at kristin@livablesolutions.com.